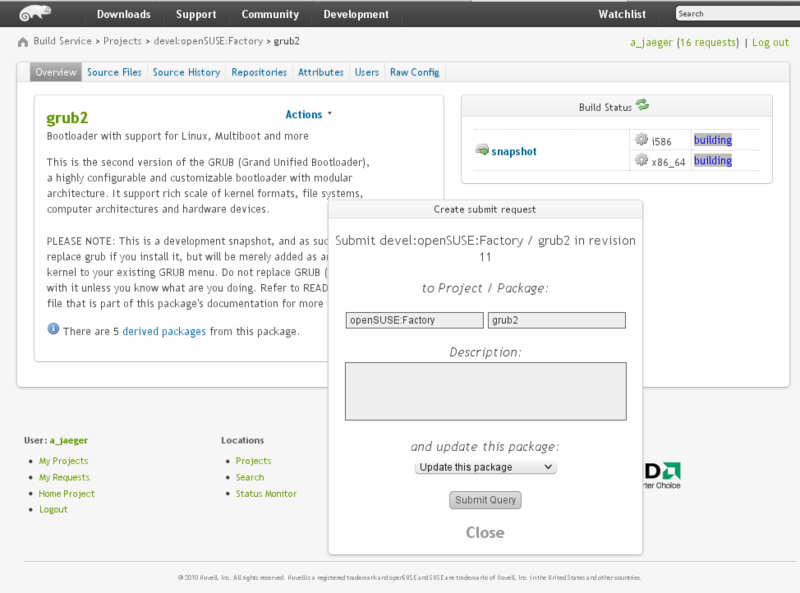 The openSUSE Build Service – OBS – isÂ now officially at release 2.1. We’re delighted with the improvements inÂ this release, including an enhanced web interface, integration with online code management systems and better access controls. This iteration has enhanced the web user interface of openSUSE Build ServiceÂ with features that were previously only in the osc command line client. ItÂ now allows submitting of packages to other projects, showing a history of changes and who did them, with associated comments. This means that the full work flow needed to build packages, contribute them to projects and collaborate on them is available from the web interface. Users of the Build Service may now access a new concept called ‘source services’. 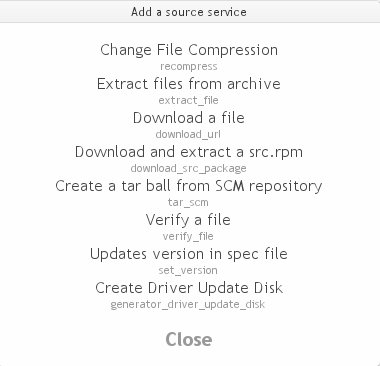 Source services allow, for example, the automatic checkout of source code for a package from a remote server via Git or Subversion, building a tar ball from these checked out sources, and using them for building a package.Â It also enables direct download of tar balls from remote sites. This allows packagers to work with external sources without downloading them to their own workstations, and makes it easy to rebuild packages after upstream changes with a single click. The access controls have been enhanced so that read/write access to a projectÂ can be granted on an individual basis. This allows for tighter control of work flows where needed. You can for example ensure people don’t have access to security updates while they are being tested. For more information about the Build Service, check Portal:Build_Service. This release of the OBS has received many contributions from otherÂ companies, communityÂ members and foundations, making this release aÂ truly collaborative product. We would like to thank everyone who helped make the openSUSE Build Service 2.1 possible! Special thanks go to Martin Mohring and the OBS team at The Linux Foundation, who contributed the extended access handling. The Build Service is an open package and distribution development platform providing a transparent infrastructure for developers to build packages for a variety of Linux distributions and hardware architectures. build.opensuse.org is a freely available service and can build packages for theÂ most popular distributions besides openSUSE including SUSE Linux Enterprise, Debian, Fedora, Mandriva, Red Hat Enterprise Linux andÂ Ubuntu. The Build Service aims to significantly reduce the costs and risks relatedÂ to the distribution of applications, from building, providing and maintaining them. It does so by providing a convenient web and command-line interface, which developers can use to upload their code and build instructions. The Build Service will then create a clean, virtualized operating system, install any required build dependencies and create the package. This process will be repeated for each supported operating system. Once the build is finished, all packages will be made available in a set of repositories for easy distribution. The Build Service at build.opensuse.org currently builds about 100,000 packages from 25,000 users working on 15,000 different projects. Communities and companies using their own Build Service installation include the MeeGo Project, VLC team, Dell, Cray and many others. The ability to pull in and install code from source from a third party is going to make life a lot easier. hi, opensuse site devs – i’m not a THAC0. Issue reproduced after i refreshed the page opened from firefox RSS. Are there any instructions on how to pull in code from an external repository, specifically a git repository? I can’t figure out how to do it (at least not with a useful filename). Face it… you ARE Thaco. The only posts from Thaco are yours. You must learn to accept your identity and get over the denial. The sooner you embrace your inner Thaco the sooner you will be able to leave these issues behind and enjoy openSUSE. Sorry guys to leave a comment here, but this appears to be the only way. Just about every weekly news item …..”just head over to our comment centre”….The word “comment centre” is a hyperlink which takes you no where but and endless loop to other weekly news – Can we please fix that the hyperlink ‘comment centre’ actually take everyone to a comment space, rather than endlessly chasing every weekly news in existence! OpenSuse Wiki does it again!